A calm, colorful (usually green), vibrant land that may have tropical elements. Very often the first level and usually easier than the other stages, to let the player get used to the controls, powerups, and enemies. Often the first area of a Platform Game, and typically the home of the Warmup Boss. 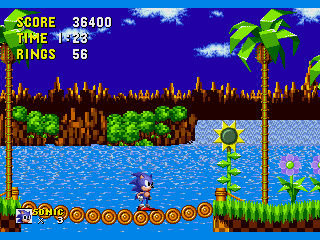 A more cheerful subtype of Green Hill Zone is a flower-themed level. Kind of like Ghibli Hills, except for the whole Everything Trying to Kill You thing. Named for the first stage of Sonic the Hedgehog, which pretty much defines this trope. Compare Palmtree Panic, a beach-themed Sister Trope. This is a recurring theme in the Sonic series, showing up in almost every game. It's easier to list the exceptions. Sonic 2 for the Master System / Game Gear is the earliest exception: its own Green Hill counterpart, imaginatively titled Green Hills, doesn't appear until the fourth zone. It's hardly a warm-up level either; the third act contains a series of blind jumps which makes the player lose lives like water in a sieve. Angel Island starts out as a textbook example of this, until halfway through the first act, when the miniboss sets the place ablaze. Mecha Green Hill, from Sonic the Hedgehog Chaos on Master System, is a Green Hill Zone mechanised by Eggman, with polluted streams choked with oil and chemicals, and exploding coconuts falling from mechanized palm trees. Complete with a reworked version of the music from the previous game's Green Hills. The Japanese Sonic CD theme was also a reworked version of Green Hills. In the time-traveling Sonic CD, the Good Futures of Zones are generally garden-like paradises or clean hi-tech utopias completely devoid of enemies, with technology working in harmony with nature. They are also the easiest versions of the levels to pass through. The Bad Futures on the other hand are hideously polluted nightmares that are much more difficult to complete. The Labyrinth of the Sky from Sonic Labyrinth. Sonic Advance 3 is another exception. The first zone is Route 99, a city level. The Green Hill Zone comes afterward. Sonic Colors has Planet Wisp, a mash-up of Green Hill Zone and Eternal Engine. This is a common theme for the earlier levels in Super Monkey Ball. Most Super Mario Bros. games place the first level here, being usually set in a cutesy magic fantasy kingdom of sorts. Still, just because later levels are unusually green and leafy doesn't mean they aren't harder (see World 3 in Super Mario Bros. 2 and the Forest of Illusion in Super Mario World). In Super Mario Galaxy, the first planet of Good Egg Galaxy is your standard grassy fare, but the rest of it is a hodgepodge of various elements. Honeyhive Galaxy is this trope overlapped with The Lost Woods. Beanstalk Way from Wario World, although it's the sixth of eight levels. The first Ape Escape has Fossil Field: small, easy level with green grass and palm trees. Kirby's Dream Land and its Green Greens. The nostalgia-heavy Kirby games to follow generally follow suit. Though in the multiplanetary Kirby 64, Pop Star itself was the Green Hill Zone. The Calm Lands of Final Fantasy X is more or less a Green Hill Zone, even if it is nearer the end of the game. Admittedly, you learn a lot about controlling Chocobos here. The Calm Lands appear calm, but actually have a really irritatingly high encounter rate; some of the monsters you encounter are much more difficult than the average random encounter. This can be quite a shock to the system for player who have cruised through up till then. Destiny Islands from Kingdom Hearts provides the tropic-themed Doomed Hometown Sora starts up from. It's all downhill from there on. The idyllic Twilight Town from Kingdom Hearts II provides a more urban setting, though our resident Kid Hero steals a moment of blissful peace atop a literal green hill before eveything goes downhill. The place isn't doomed, though, and can be revisited. Sandover Village in Jak and Daxter. Super Smash Bros. Brawl has a stage called Green Hill Zone, from the Sonic game, and it fits visually; however, the dips, hazards and collapsing middle make it quite complicated. The stage Battlefield fits this trope better. In World of Warcraft, Mulgore and Elwynn are both lush, green rolling hills. Night Elf areas are also pretty green and hilly but have a more Lost Woods flavor. So do the Glades of Tirisfal. Eversong Woods for the Blood Elves plays it straight. As do the Lost Isles for the Goblins, sort of; they only wind up there as shipwreck survivors after being forced to flee their homeland, Kezan, when a volcano explodes on them. N. Sanity Beach and the surrounding tropical forests in many of the Crash Bandicoot games. Spiral Mountain, Banjo's home and the starting area of the first two games. Nutty Acres in Nuts & Bolts fits this trope to a tee save for one important detail: everything is synthetic, including the trees, ground, and even the sky. Corneria in the Star FOX series. Thorntail Hollow in Star Fox Adventures. The planet Diamondus in Jazz Jackrabbit. Grasstown in Cave Story is one of the earlier stages, but its difficulty level is a notch above easy. The Mimiga village might be thought of as an example; it's greener than most of the other areas and gives you a chance to practice jumping at the beginning, with a Warmup Boss and some easy enemies in the Cemetery. The first couple of levels in Eversion. Real life, sorta: Green circle runs on ski hills (runs marked with green circles are for beginners; blue squares are intermediate; black diamond is about as intimidating as it sounds.). Or, a Hill's Green Zone (bad-dum ching!) Though if it's tropical, it's probably not very fun. Parum in the Phantasy Star Universe series. Its improbably idyllic, Ghibli Hills-esque nature is actually lampshaded and justified in Phantasy Star Portable: it's all artificially created. All of Parum's real wilderness was destroyed in the backstory's 500-year-long war between the races. The first level of Klonoa fits this exactly. Lush fields, simple gameplay, and overall idyllic. Klonoa 2's first level is an inversion, however: it's a rocky and cliffy area, set in the middle of a huge storm. The first world in Sigma Star Saga is the Forest Planet. The first world in Scribblenauts is in a forest. The green, temperate Ascadian Isles in The Elder Scrolls III: Morrowind, in very great contrast with the Bitter Coast swamps, or even worse, the Ashlands and Molag Amur. Also subverted in the Grazelands, dotted with rogue Ashlanders and Daedric shrines full of insanely powerful monsters, with the occasional monster out in the wild. Falkreath Hold in Skyrim appears to be a relatively peaceful boreal forest surrounded by wartorn mountains, tundra, swamps, and glaciers. The Spyro the Dragon games make use of this trope, with the exception of the Legend of Spyro games. Croc's first world is like this, though its levels do contain lava and underground sections. The first forest levels of the original Rayman game before the game becomes Nintendo Hard. The first sector in Jumper Three. Sector 5 is the rainier version of this. In Maple Story, these levels are Maple Island and Lith Harbour. Blue Lagoon in Pangya, and Pink Wind to an extent. Averted with Blue Water, which is Blue Lagoon with more obstacles interfering with shots, most notably the rock pillar on hole 6. Lampooned in the webcomic Toothpaste for Dinner on October 18, 2009: Water, ice and lava are OK for later world themes, but the first world must always be just "outside world". In Rift, the first Guardian leveling zone outside the Noob Cave is one. And it's swarming with nasty faeries. Insectia in Bug! !, a grassland level which is obviously full of insect Mooks (and the occasional snail). Phantasy Star Online Episode 1 starts you off in the forest area, filled with mostly harmless mooks. In Jabless Adventure, the first area you encounter is the green fields outside the town. Ironically, it may be one of the harder areas in the game, as you start off with few health points and no weapon—and the path to the weapon has a number of erratically-moving bird enemies. Two of the Guild Wars starting zones are this type of terrain: Pre-searing Ascalon and Shing Jea island. Act I of Diablo II takes place in the forested areas between the Rogues' encampment and their Monastery. Act I of Diablo III takes place in and around New Tristram, which was a farming community before being overrun with the walking dead. That may not sound very friendly, but considering that the subsequent zones are a burning desert, a frozen wasteland, and the war-ravaged ruins of Heaven, the gloomy rain-soaked New Tristram seems positively welcoming. Athena: World of Forest, the first level. Night Of Spikes in Something. It's unusual because it takes place at night and it has a lot of spikes. The Flower Island in Something Else. A major portion of World 5 takes place on said island. The Safe Shallows in Subnautica. The game's starting zone, where your Escape Pod ended up, it's shallow and reasonably safe, and has most of the basic resources you need to get a foothold on surviving. This page was last edited on 30 March 2018, at 13:13.